Geisha are loved for their elegance and refinement, yet they remain a type of living myth. Kyoto, Japan’s former capital city, has preserved a traditional image, and it is an excellent city to witness a geisha crossing street or during a dedicated ceremony. 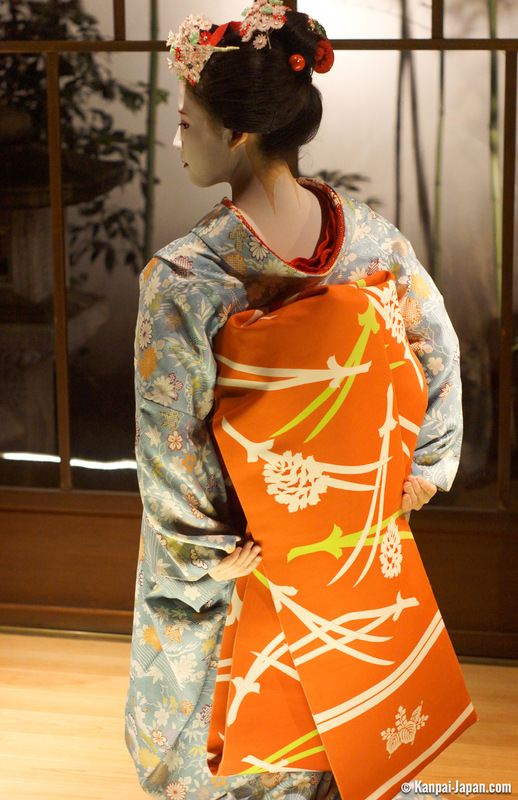 This includes both apprentices (maiko) and confirmed geisha (geiko). Before they can fully perform their role in entertainment, geisha must pursue a long and demanding training in numerous disciplines; this is difficult for any young Japanese girl, even one who is highly motivated. The first stage of training occurs around the age of 12, when the girl is accepted into a lodging house called an okiya. She then becomes a servant called a shikomi-san. The Japanese education system is mandatory up to 15 years old, so the girl must take classes in addition to her training in domestic service. In reality, most trainees quit school after middle or high school. The shikomi-san takes care of all sorts of household chores. She assists older maiko and geiko in dressing, putting on makeup, and washing. 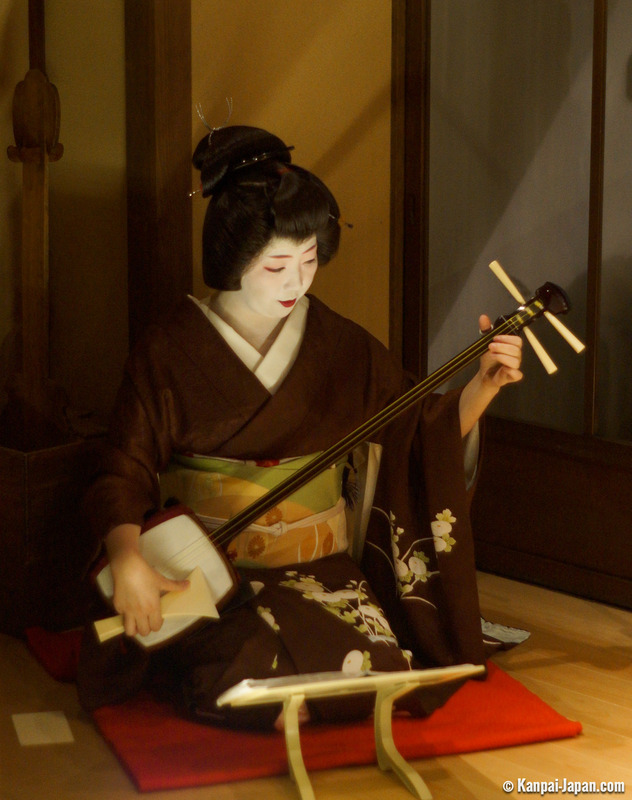 She is also responsible for transporting musical instruments such as the Japanese guitar (shamisen). During the shikomi-san period, which lasts one to two years, the trainee also has to undergo an initiation, which includes dressing in a kimono, playing the flute and drums, and mastering traditionnal odori dance. Moreover, she must learn the former language of Kyoto (Kyo-kotoba), even if she is not a native of the Kansai region (as many apprentices are not). 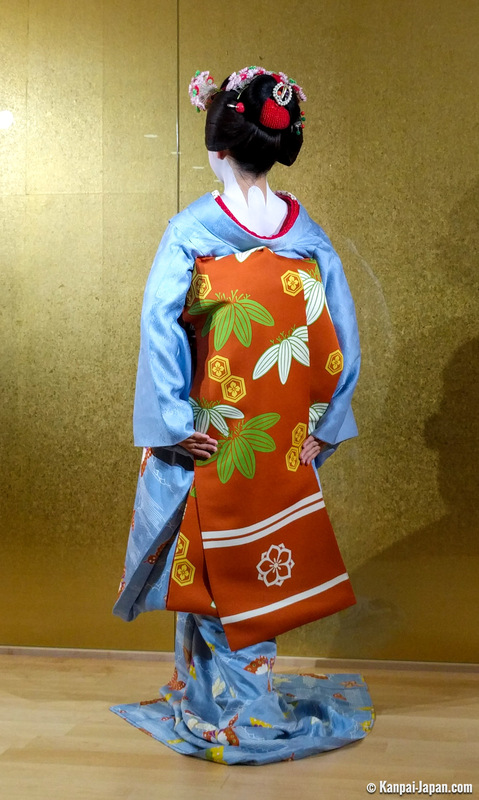 The shikomi-san can wear Western-style clothing or a kimono, depending on the context. No family contact is allowed, outside of certain public events, such as Obon (Celebration of the Spirits) and Shogatsu (New Year’s Eve). Once the mother of the house (called an okasan) judges that the shikomi has sufficient training, the trainee must pass a test at a Kaburenjo Theater. Many young girls quit if they fail this test, as this period of learning, although short, is very compact and tiring, with only a few hours of sleep possible each night. If an apprentice successfully passes the test, the okasan chooses the girl’s maiko name. The first part of this name is usually the same as the girl’s okiya name. The second part of the name, however, depend on the directions that the okasan gives to the apprentice; this could be a name with artistic appeal or one that is linked to her beauty or her financial situation. Misedashi is the name of the day when the trainee is officially introduced to society. Decorations and her new name are displayed on the okiya’s walls. In addition, fans (uchiwa) with her image are offered to the house’s best clients and to other returning clients in the hanamachi, or the district linked to the okiya. 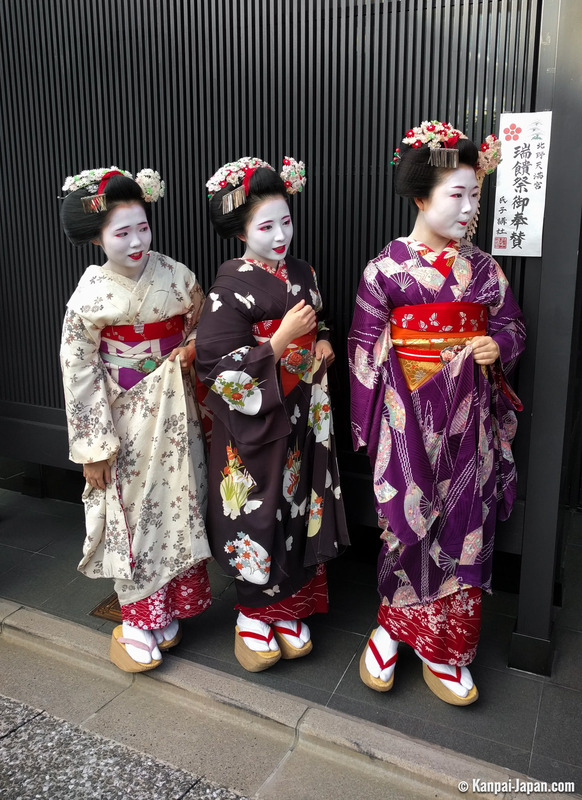 Then, the newly elected maiko chooses her godmother--a sister and mentor (called an onesan), from among the relatively experienced sisters in her house (either maiko or geiko). The San San Kudo ritual, which happens in the Kaburenjo Theater, links the two women forever; this ceremony is similar to the sharing of sake during a Shinto wedding. At this time, the Minarai phase starts. While still in training, the new maiko simply accompanies and observes her onesan during her artistic performances. For the first month, the trainee wears a belt (obi) that has been cut in half. For her entire first year, she cannot wear red on her upper lip, and she must display a flower in the side of her hair. The apprentice continues to learn the traditional arts by taking classes at the Kaburenjo in areas such as the traditionnal tea ceremony, floral art (called ikebana), dancing, singing, music, and calligraphy. Maiko are between 15 and 20 years old. Some are older because they serve as onesan of a young maiko. In 2017, the oldest maiko in Kyoto was 24 years old. 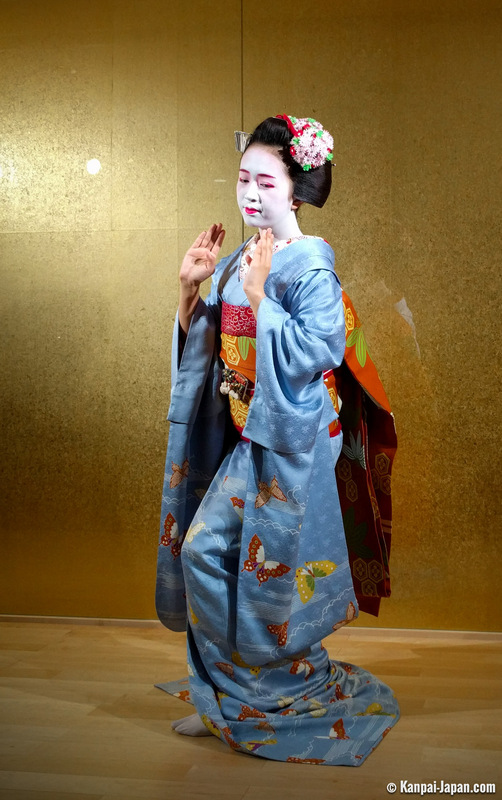 The transition from maiko to geiko is called Erikae. Changes can be observed in the girl’s appearance during this transition. Her kimono sleeves become shorter, her collar becomes only one color (usually black or white, as opposed to the maiko’s collar, which is often red). Finally, the future geiko changes her hairstyle and adopts a wig of the sakko style, which is relatively subtle. The final step is the Hiki-iwai celebration, which signifies the geiko’s withdrawal from public life. There can be several reasons for this retirement phase, including old age (although there is no official age limit), a private wedding, or the decision to lead an okiya or a tea house (ochaya) as an okamisan. 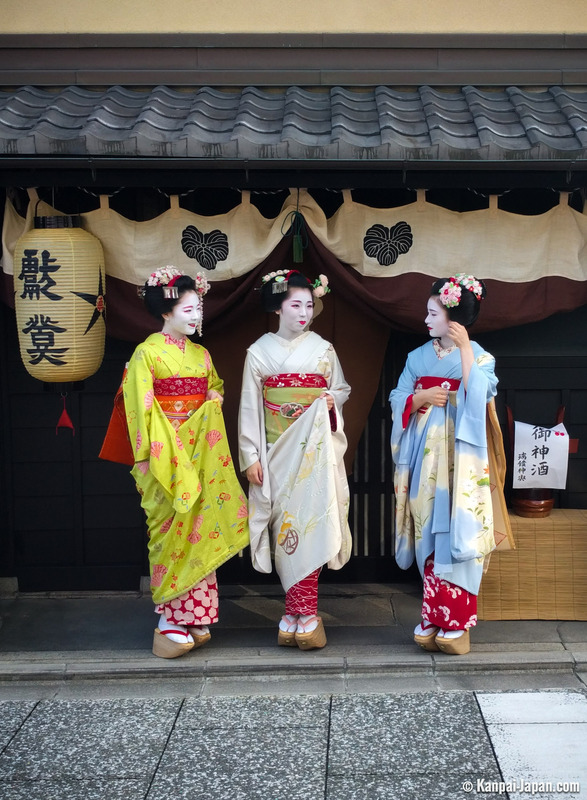 There are several opportunities to spot a geisha in Kyoto. The classical method that tourists use is to wait, like paparazzi, for the ladies to come out of their houses on their way to a tea house. For this method, it is helpful to know the locations and hours that provide the best chances to see them, such as Hanami-koji Street in the Gion District at the end of the afternoon. Moreover, national celebrations such as Matsuri and Setsubun sometimes allow visitors to see geisha during a free show; however, at these shows, be careful of the crowd. 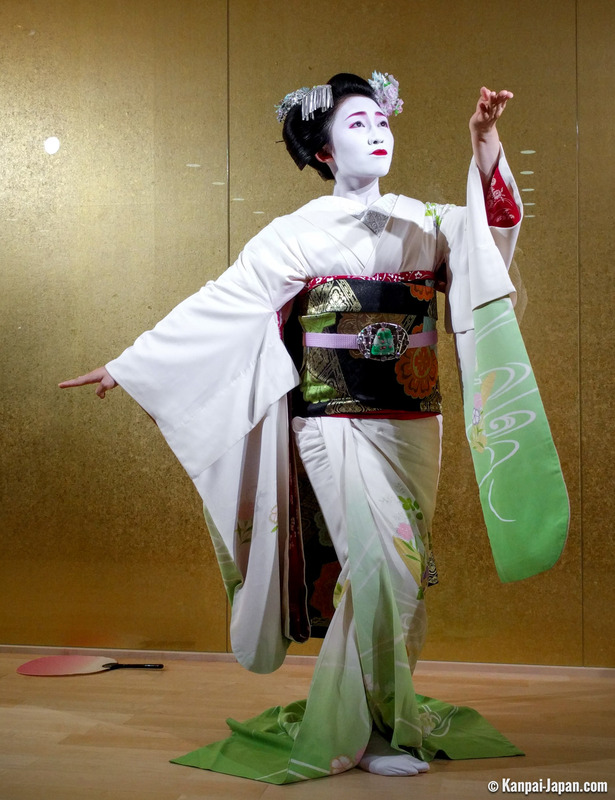 Performances with Odori dance (maiko and geiko): Shows are planned according to the season: spring shows start in April or May, and fall shows start in October or November. Each hanamachi in Kyoto has its own shows. There are three daily shows, each lasting 50 minutes. 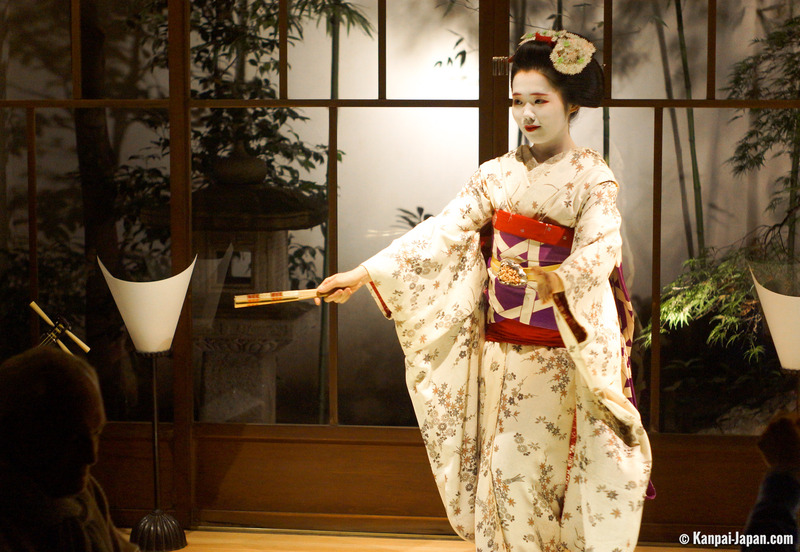 Advance booking is mandatory and can be done online for the Miyako Odori in Gion. The cost starts at ¥3,500 (~US$ 31.30) to ¥4,600 (~US$ 41.10) per seat. Photo shooting session: This session includes maiko and geiko in a Japanese traditional decor and is organized for a small group. Each session lasts for two hours, online booking via the website 55maiko.net is mandatory. The cost is between ¥10,000 (~US$ 89.40) and ¥35,000 (~US$ 312.80) per person. There are two inconveniences in this option: The show is only in Japanese, and there are a limited number of sessions per month. Day meeting: This includes a tea ceremony and souvenir photography. The session is for a group and lasts 90 minutes; online booking via the Maiko Theater website is mandatory. The cost is about ¥7,000 (~US$ 62.60) per person for the afternoon’s services. 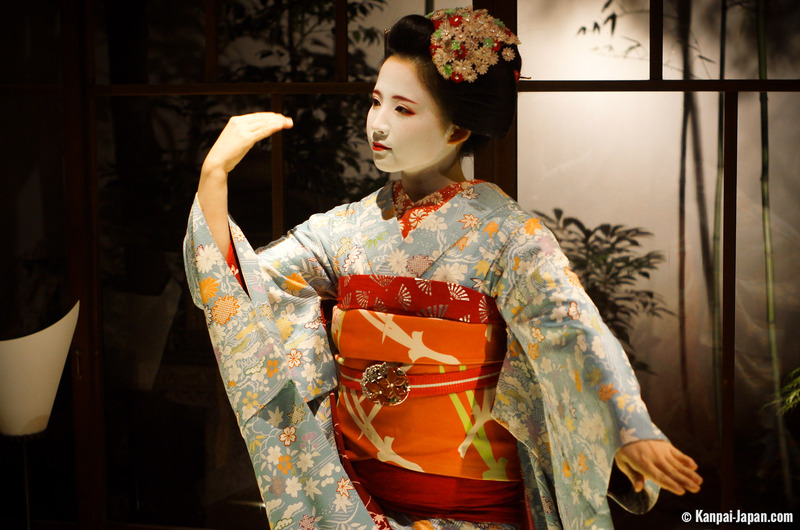 The maiko performs two dances, and it is possible to talk with her in English for 5 minutes. Photos without flash are allowed. Private dinner: This option includes artistic shows, games, and conversation. 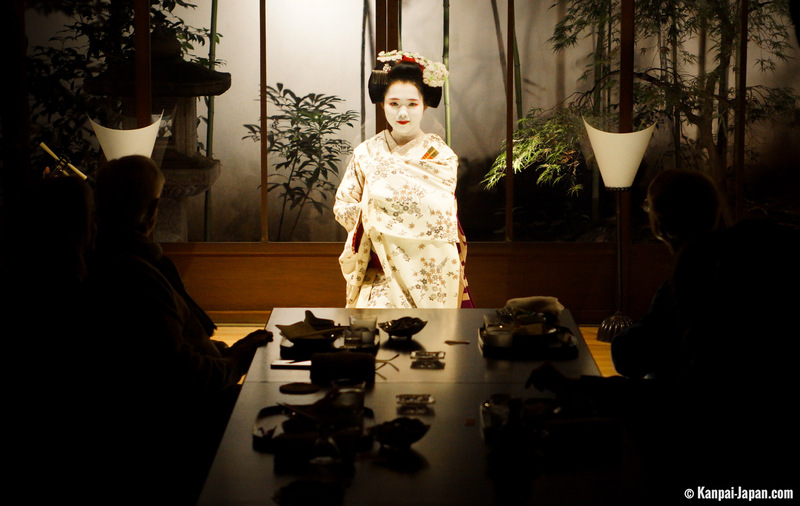 The session is private, in the form of a traditional banquet (ozashiki) that lasts 3 hours. The cost is about ¥60.000 (~US$ 536.20) to ¥90.000 (~US$ 804.30) per person. This is a unique and very high-end service. 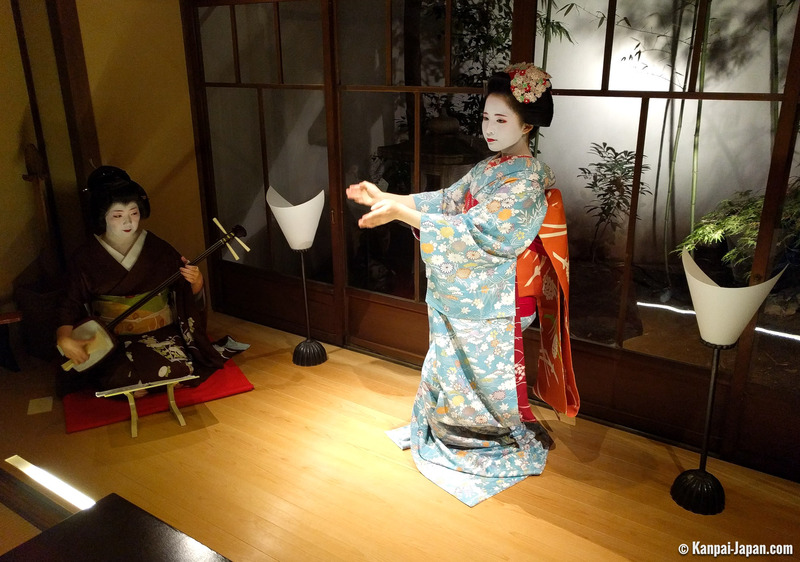 At this dinner (called a kaiseki), two maiko and one geiko serve drinks to the guests, engage in one-on-one discussions, and entertain guests with dances and child-like games. A shooting session concludes the encounter.